We are honored to bring you 25 bloggers fall porch tours. Today we present porches 11 - 15. We are very intrigued by their ideas and happy to show you what they have done. We thank each of these bloggers for sharing their autumn decorating ideas with us. 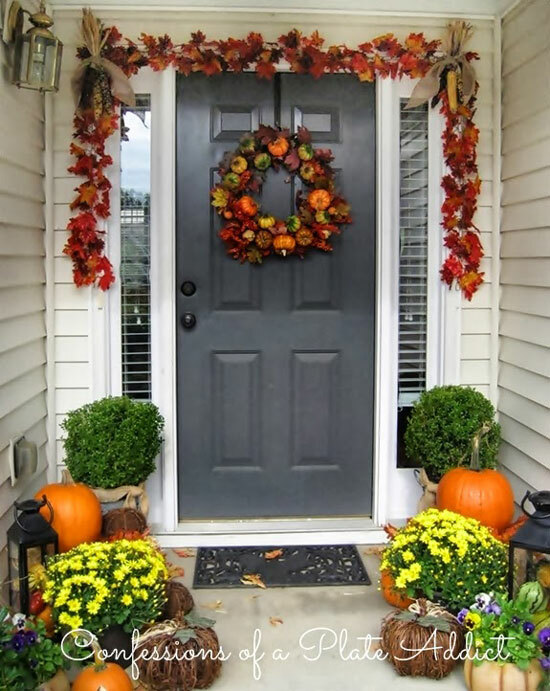 Heather, author of Setting for Four, is an Interior Designer and she has 5 fall porch decorating tips for adding curb appeal. I am always happy to learn new tips! Heather's fall porch palette is muted, soft colors with metallic accents and sparkle to tickle your fancy. 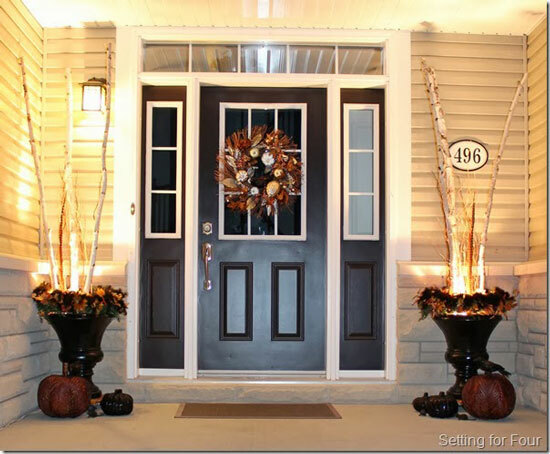 The black urns on either side of her door add height and interest. One of Heather's 5 tips is to add a spotlight to each of the urns. That gives a soft glow to her porch in the evening. Very enchanting. Another of Heather's tips is to repeat coordinating colors in your decorating scheme (at least 3). Gives the space harmony and a kind of rhythm. Heather repeated gold, brown and black on her porch. Look closer now. Heather filled the urns with tall birch branches from her yard (beautiful accent color) and curly willow branches. Notice how she used greenery, leafy garland and black boa as urn toppers. To add a bit of Halloween flavor, she included black pumpkins, tiny mice and crows as well. A little bit of ewww! But just right. 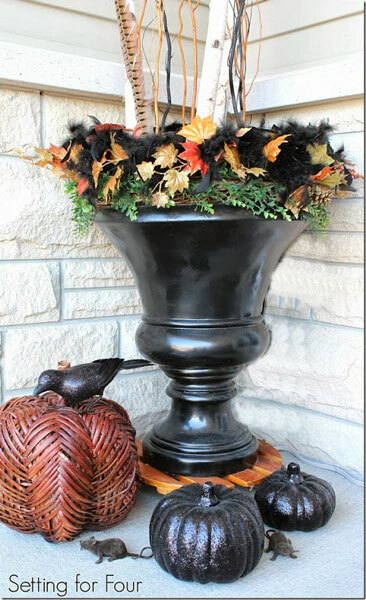 If you stop by Heather's blog, Setting for Four, you can see many more fall porch pictures and get all five of her autumn porch decorating tips. 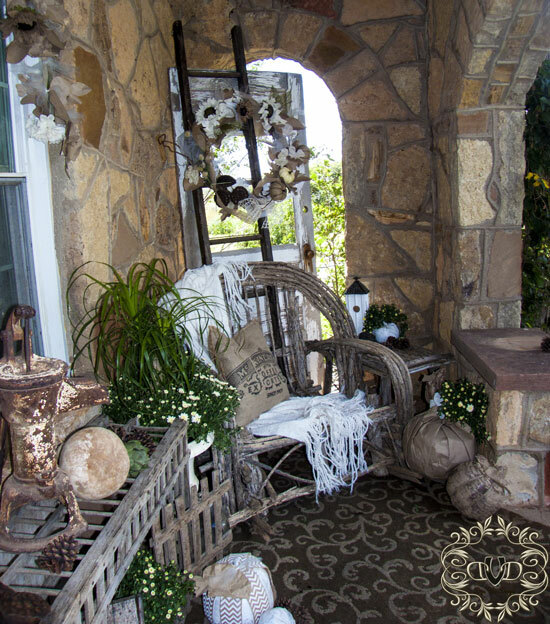 Tammy, author of Deja Vue Designs, chose natural colors for her fall porch: beiges, whites, naturals. Her rock porch is such a calm and intriguing place. Tammy calls her porch humble, but my goodness, it's a natural beauty! So much to look at - interesting textures and lovely soft colors. Do you see Tammy's bent willow chair, feedsack pillow and sweet paper pumpkins? I like how the white pops on the soft blanket on her chair. Tammy makes an interesting point about using soft colors on your autumn porch - how easily that transitions into the Christmas season. I can just imagine how easily she could add a few sparkly fun elements to turn this autumn scene into a magical holiday porch. What caught our eyes here is how Tammy hung her beautiful wreath on the old ladder. 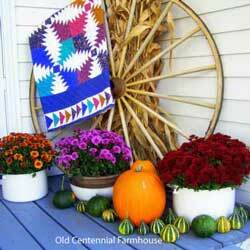 Tammy made that wreath using ribbons, bows, pumpkins, flowers and a leaf template that she provides on her blog. Did you see the vintage white-washed door? Pure charm there. Please visit Tammy's blog, Deja Vue Designs, to see more close-ups and the scoop on the big "letter K". 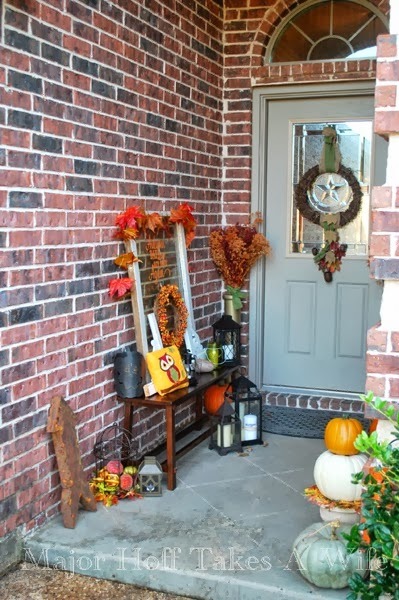 Debbie's entryway is richly decorated with classic autumn finery. Debbie is the author of Confessions of a Plate Addict. What I noticed right away is the leaf garland around her door. She added Indian corn at each corner tied with jute ribbon. That extra little decor makes a nice difference! 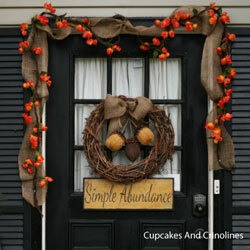 Debbie crafted the wreath on her front door - an inspiration from Pottery Barn. 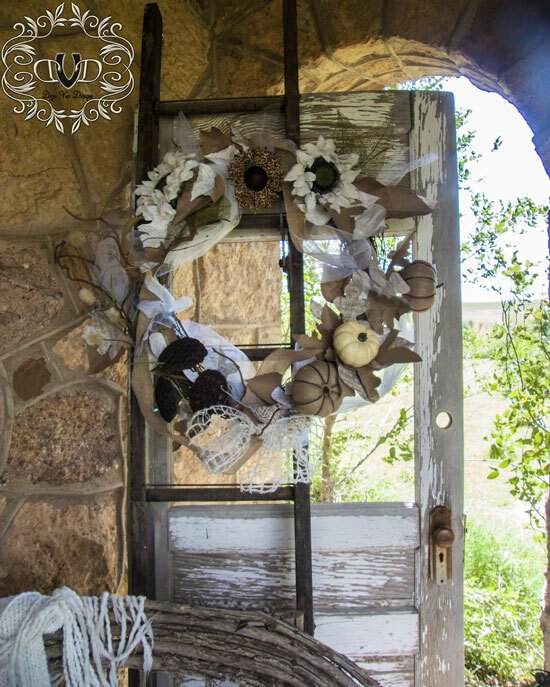 Debbie explains on her blog how she made this from materials she already had - a grapevine wreath, pumpkins, berries and leaf garland. Looking closer at Debbie's autumn arrangement, I like those twine pumpkins. I wonder if Debbie made those. Did you ever notice that adding green plants or fresh greenery always brings a fresh element to your decor? Hop on over to Debbie's blog, Confessions of a Plate Addict, to see her pumpkin planters - and the niftiest galvanized buckets she found from Walmart for around $10. Leslie, author of House on the Way, has more than one porch area so it wasn't easy choosing which to show you. So I selected her covered porch. On her covered porch, she has two wicker chairs and a nice table in-between. 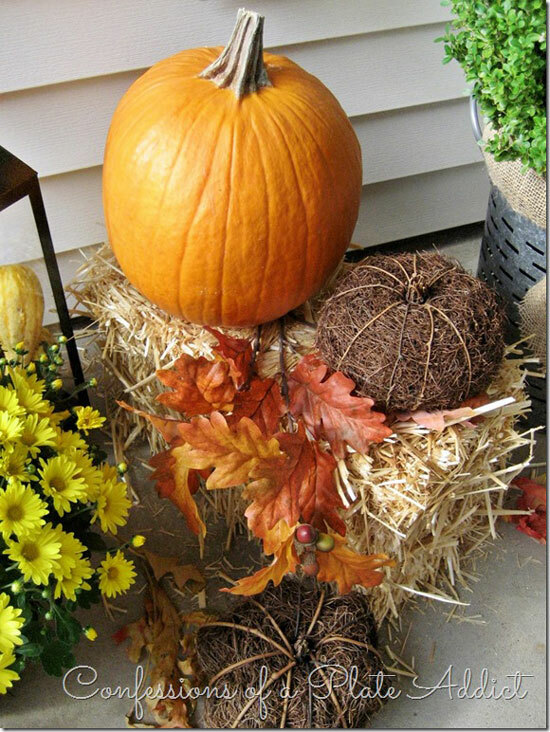 The wicker table is a wonderful little spot to display an array of autumn decorations. Leslie filled her red wire baskets with leaves and pumpkins. And do you see the cornucopia basket on the table, too? She filled it with acorns. Right away I noticed those narrow and tall wicker baskets hanging on her French doors. I like those - not something you see often. Leslie filled them with red berries. They are both simple and beautiful and would look wonderful if left up at Christmas time, too. 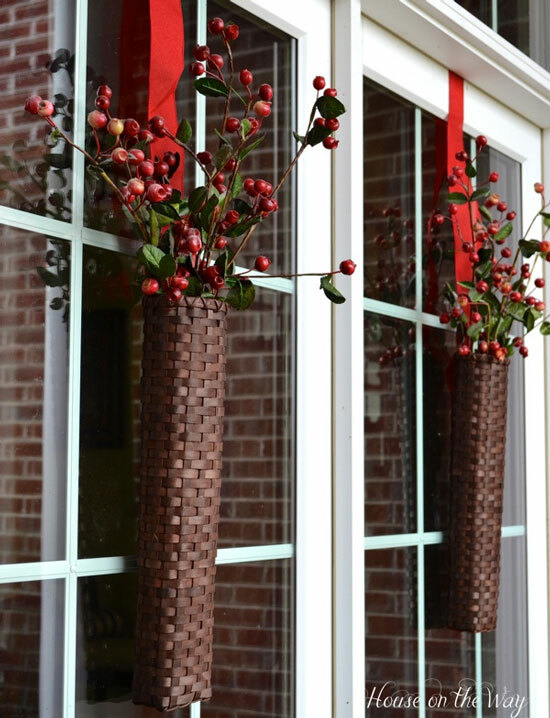 Sara's covered porch is narrow and long so she says it is rather challenging to decorate it. But we think she did a fantastic job. I really like that narrow bench that Sara uses to display her sweet fall palette including a wonderful vintage window, lanterns, pumpkins and even a rustic tin arrow. It's the perfect size for her porch. And do you see the tall narrow planter in the corner of her porch? Sara made that as well. S he has one in the other corner, too. The flowers are dried Texas weeds. Never saw weeds so beautiful as those; Sara got them at an Arts Festival. Sara made the autumn wreath on her front door from a grapevine wreath, burlap ribbon, acorns, wooden leaves (that she painted) and twine. Catch the full tutorial on her blog! 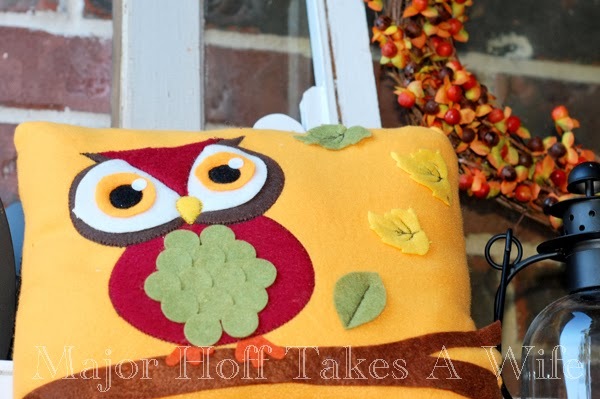 This sure is a sweet little owl pillow. Sara found it at Target for just $3. That's a steal and is a focal point on her porch. We like little touches like that- they make you feel welcome and happy. Please visit Sara's blog, Major Hoff Takes a Wife to see more close-up pictures of her Texas autumn porch. We are so glad we could share her fall porch pictures with you. What an opportunity to feature the 25 Bloggers fall porch tours with you. This is #11 through #15 porches with 10 more to come. Such inspiration and creativity.